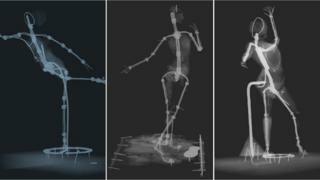 Scientists have used X-ray images to show that the artist Edgar Degas used everyday objects, such as wine bottle corks, to bulk out his wax sculptures. Only three of the artist's rare beeswax creations - depicting dancers - are held in the UK. Conservation scientists at the Fitzwilliam Museum in Cambridge have analysed the sculptures ahead of an exhibition of Degas's work. The artist was famous for his oils on canvas and prints and identified particularly with the subject of dance. One of his most notable artworks is the bronze Little Dancer of Fourteen Years, which is held in the Metropolitan Museum of Art in New York. The trio of dancer sculptures in Cambridge - Dancer Bowing, Dancer with a Tambourine and Arabesque over Right Leg, Left Arm in Front - are rarely put on public display because of their fragility. All are modelled in beeswax and are impressed with Degas's fingerprints. A spokesperson for the Fitzwilliam Museum said: "The use of ordinary shop-bought armatures, wine bottle cork and old floorboards, confirm Degas to have been a highly unorthodox sculptor who used unconventional working practices, in terms of materials and technique, which resulted in the frequent loss of his wax sculpture." The works were among 75 pieces discovered in Degas's studio in Paris after his death 100 years ago. The majority are now held in the National Gallery of Art, in Washington, USA. It's believed Degas "bulked out" a wire frame within each piece by adding lightweight domestic objects he had lying around his studio. Wine bottle corks were used as fillers in the head, chest and abdomen cavity of the Dancer with a Tambourine, experts revealed. Victoria Avery, keeper of applied arts at the Fitzwilliam Museum said: "Degas defied tradition as well as contemporary practice to resist having his sculpture cast in bronze. "It is therefore deeply ironic that Degas's fragile and deliberately ephemeral, one-of-a-kind sculptures are now best known from their durable bronze serial casts, displayed in public and private collections across the globe."